Michigan, which is shortly mentioned as MI, is one among the 50 states in the United States, situated in the Great Lakes area of the Midwestern part of the country. Michigan is surrounded by the Great Lakes, such as Lake Huron, Lake Erie, Lake Superior and Lake Michigan from east to west. Michigan is bounded by Indiana and Ohio on the south, sharing water and land boundaries with both cities. The western boundaries of Michigan are almost totally water boundaries, ranging from south to north, with Wisconsin and Illinois in Lake Michigan, and then a land border with the Upper Peninsula and Wisconsin, that is chiefly demarcated by the Montreal and Menominee Rivers. The state is surrounded by Minnesota and Wisconsin in the west, restricted around by the Ontario province of Canada to the east and north. Michigan is the 11th most wide-ranging area and the 9th most populous among the 50 states of the country. The state includes the maximum number of lighthouses in the country. 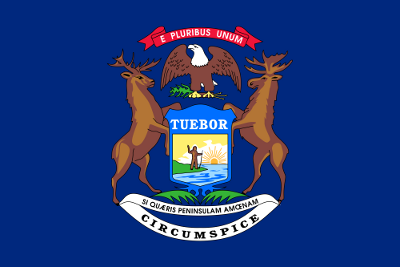 Michigan was the 26th state admitted to the union on the 26th of January 1837. The total land area of Michigan is 96,713 square miles, which offers the state an area rank of 11 out of the available 50 states in the United States. In addition, water surface occupies 40,185 square miles of the total area of the state within its boundaries. There are 83 counties in Michigan among which the Dickinson County was the most recent county formed in the state, in the year 1891. Consistent with 2010 United States Census information, the population of Michigan was 9,938,444. Among the counties of the Michigan State, the most populous county is the Wayne County with the population of 1,820,584, and the Keweenaw County is ranked as the least populous county with the population of 2,156. As of 2010, there are 17 State Electoral Votes in Michigan. The State Quarter issue Date of Michigan is January 26, 2004. The state motto of Michigan is “If you seek a pleasant peninsula, look about you “. Great Lakes State or Wolverine State is the nickname of the state of Michigan. The name of the state bird of Michigan is the American Robin. Eastern white pine is the state tree of Michigan, and the Apple Blossom is the state flower. Lansing is the state capital of Michigan. Detroit is the biggest of all cities in Michigan by population, and the city ranks first in total land area, too. Sault Ste. Marie is the oldest city in Michigan. The Michigan State is served by 11 area codes, such as 231, 248, 269, 313, 517, 586, 616, 734, 810, 906 and 989.